This story originally appeared on Jan. 22, 2016. On Nov. 15, 2015, U.S. Air Force A-10 ground-attack planes and AC-130 gunships blew up a truck park near Abu Kamal, Iraq. The American pilots destroyed more than 100 tankers carrying oil that could fund the Islamic State. The Pentagon followed this up with another massive strike on Nov. 22, taking out nearly 300 trucks in an attack near Al Hasakah and Deir Ezzor in neighboring Syria as part of Operation Tidal Wave II. The planes dropped leaflets in the area before the bombs, missiles and cannon shells came raining down. Drivers at Abu Kamal got the warning 45 minutes before to abandon their vehicles … or die. But that wasn’t all. After the briefing, War Is Boring submitted a Freedom of Information Act request for any leaflets used during Tidal Wave II and obtained low resolution copies of two of the messages dropped during the campaign. As it turns out, the leaflet provided to the press was only its front side. Flip it over, and the back side appears to show a burning truck. “Oil trucks are being destroyed because buying this oil is the lifeblood of Da’ish. 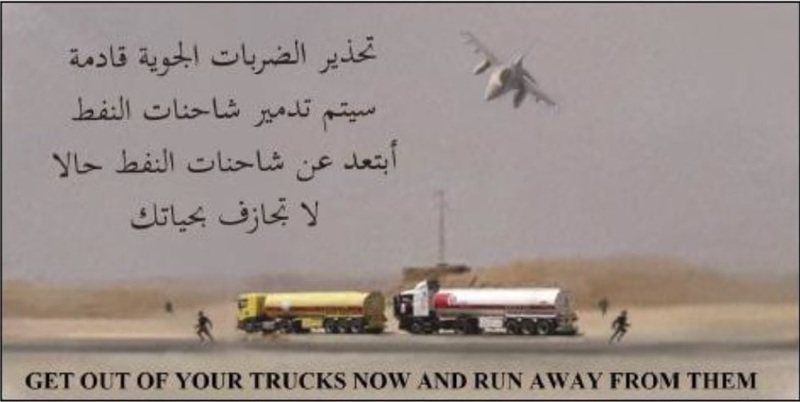 Leave the trucks and flee,” the Arabic-only message explains. Da’ish is the Arabic acronym for the Islamic State. A second leaflet seems like it could be targeted at refinery workers and truck drivers. The quality … isn’t great. The low resolution, black-and-white scan makes it hard to determine the background image. 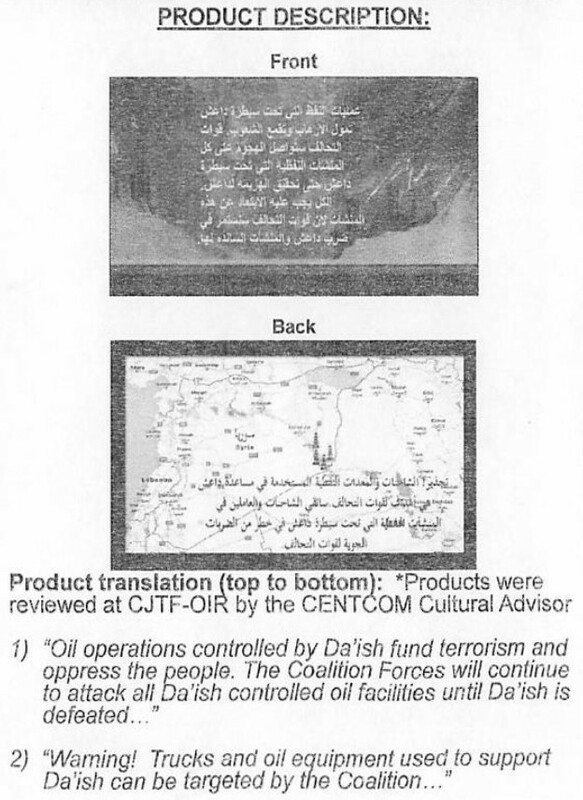 According to the information we received, a U.S. Central Command cultural adviser reviewed both “products.” To be most effective and not unintentionally offensive, the messages would need to use language and vernacular appropriate to the region. We don’t know how well the warnings worked before either attack. “We did see some civilians run away from their trucks, but for some reason they ducked into a tent that was maybe 100 meters or so away from where these trucks were congregated,” Warren said after the Abu Kamal strike. 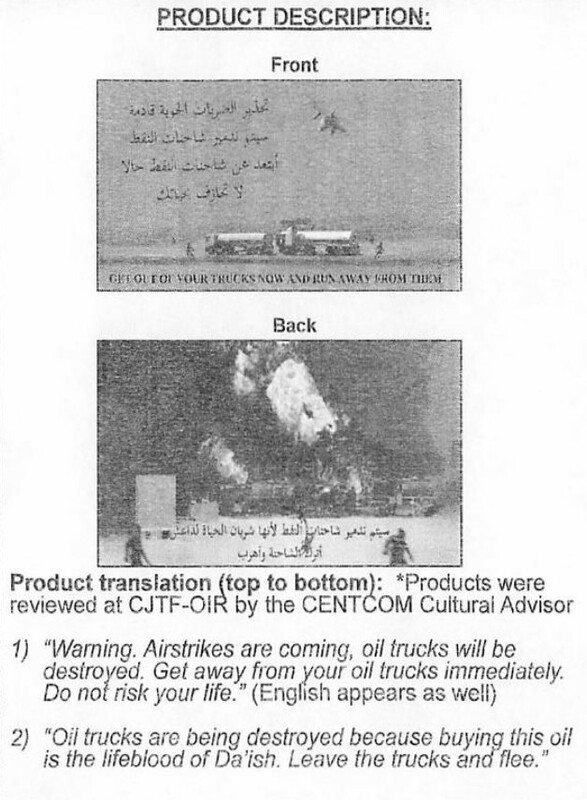 It’s not clear whether the A-10s or other aircraft dropped the leaflets. Various U.S. Air Force, Navy and Marine Corps aircraft can all carry the special PDU-5 leaflet dispenser. Using the same shell as the Rockeye tank-busting cluster bomb, the PDU-5 bursts open and scatters the paper messages over a target.